What are the Lord's dwelling places or tabernacles as mentioned in verse 1 of Psalm 84? What are the implications of these places? 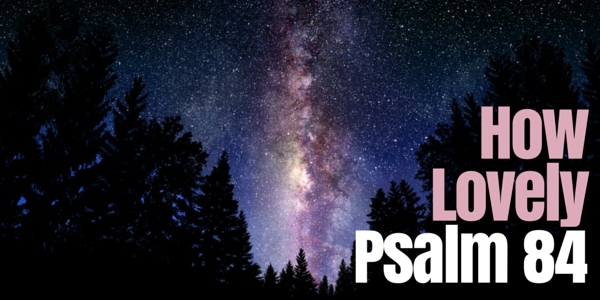 In this brief introduction, we will explore the six places mentioned in this Psalm which qualify as a dwelling place of the Lord. What follows is an exercise in word association. I simply wrote the first thing that came to my mind when considering the term. Perhaps it's not the best association, but I believe it rings true to scripture. "My soul longed and even yearned for the courts of the Lord"
Holiness. The courts were a holy place in the sense of separation. One could not simply waltz into a king's court, one must be summoned. The same holds true for a judge's court — does a 'court summons' ring a bell? This is a place that is accessible by invitation only. Further, one's behavior is also altered by this place. You do not behave in the King's Court the same way you behave in your own home. You do not behave before the Justice the way you would at a restaurant. Your behavior is also set apart (holy) in these places. Note that the holy behavior is demonstrated in the court because that is where the King is present. It's not because the room is sacred, but because our God is sacred. God is a God of holiness. He is totally and completely separated from us in every way. His ways are higher, greater, purer than ours. This is his holiness. The fact that He wants us in his courts is a mind-blowing truth. "Even Your altars, O Lord of hosts"
Justice. How could a God of such holiness ever invite us into His courts? How could we stand to be in His presence? As a just God, He must punish iniquity and man's mark is nothing more than iniquity upon iniquity. Therefore, the only reason God would have to invite us into His presence would be to execute judgement. Enter the altar. The provision that God has made for man to come into His holy presence. God's conundrum is such: He is holy and must punish sin with a death sentence, but He is love and longs to forgive. By executing a death sentence on a substitute, God's justice is satisfied and man is free to stand in His courts. In the old testament, this was done through the blood of bulls and goats but now in the perfect death of His Son. "How blessed are those who dwell in Your house!" Rest. Home is where we can kick off our shoes, loosen our belts and relax. We don't have to keep up pretenses or impress the boss. Why can we be ourselves? Because we are with the people we know the best and who know us better than anyone else. We couldn't fool them even if we tried to! Are you at home with God almighty? Are you trying to fake Him out with the good stuff you do? Don't you know He knows you better than you know yourself? He looks through your pretenses and detects your heart's condition. He can see through your actions and know your innermost thoughts, desires and motivations. Why dont we just rest in the finished work of Christ? Then we will be at home. "In whose heart are the highways to Zion!" Guidance. I know. The heart is deceitful. I understand, it's desperately wicked. I got you. But we still are motivated and directed by our hearts. It is important to train your heart so that the guidance it provides is good. Better yet, why not give your heart over to God? When you do that, when He occupies your heart's spaces, you will have the ultimate road map. He will direct your paths when His word is hidden in your heart. He wants to guide you. Let him in! "Passing through the valley of Baca they make it a spring;"
Distress. The Valley is a classic picture of distress. It is the geographically low counterpoint to the mountaintop experience. The valley is dark. The valley is obscured. We don't want to be enclosed in the valley, we want to experience the elation of the peak. Yet, with no valley there would be no peak. Where is God when we are in the valleys of trial and tribulation? He's there. Next to us. Experiencing it with us. We have a Savior who sympathizes with us because he has been there too. While sometimes poetry may seem trivial, but Footprints in the Sand rings true here. God dwells with His people. Even if it means going through the valleys. "Every one of them appears before God in Zion." The Establishment. Mount Zion was the established place where God would meet His people and accept their worship. Pilgrimages were made to this mountain and God honored these pilgrims for their faithfulness. God is a personal God who treasures personal relationships with each person He created, but there's also a place for corporate worship. When we are told not to forsake the assembly, it's not a cold rule that we need to follow. This command is not a badge to put on our sports coat so others can see our holiness. This command is for our benefit. Christ says when 2+ gather together He is in the midst He means it. He wants to join us and commune with us as a body. He meets the pilgrim of Psalm 84 in Zion, He meets the Christian at Church. This is just the beginning of the Sermon. I have three more posts coming up that deal with the three sections of this Psalm directly.